Eat rabbit – it’s good for you! According to nutritionists*, rabbit meat is good for you! It’s both succulent and flavoursome, and the meat combines both healthy eating and good flavours. Eating rabbit aids a varied and balanced diet. A balanced food, providing energy and fitness! Lower in fat than many other meats, low in lipids (av. 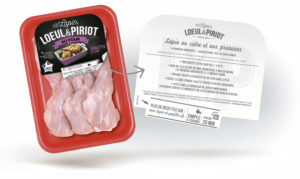 = 6g per 100g meat, notably the fillet and thigh joints). A meat rich in quality proteins (around 21g per 100g) it is also lower in calories and sodium than the majority of other meats. An excellent source of vitamins, minerals and trace elements: High in vitamins B3 and B12, phosphorus, potassium and selenium. It contributes to a good balance of vitamins and minerals for daily dietary requirements. A meat with an excellent balance of fatty acids (rabbit is richer in omega 3 than chicken* or pork*. It has a moderate fat content (depending on the type of cut). Our rabbits are fed with 100% vegetable and cereal origin feed, plus the vitamins and minerals within this feed are GM free (less than 0.9%). This, along with the other intrinsic assets of rabbit meat, assures you of quality and an optimal, secure product. Take advantage of our new presentation of our products, along with the featured cooking method, plus preparation guidelines with quick and simple recipe ideas. *Nutritional study of rabbit meat (2016) undertaken through SPRIM, by Doctor Herve ROBERT, medical nutritionist, and Marie Beatrice QUEINNEC, health and nutriton engineer.